This month’s message from me is really simple – but for you it’s what makes everything so hard. No matter what your role is within your sport – your rank in Canada, or in the World, my guess is that this year you want to do more than you’ve ever done before. To do that you have to be outside of your comfort zone way more than you’re in it. That is where magic often happens. Trust in your preparation—all of it. Not just this year’s or last year’s but from your entire career. Trust that you are experienced; trust that you are really good and that you’re doing everything in your power to be better. And then let yourself stretch; reach physically, mentally and emotionally. This image has been around for a while but I recently saw it used by an adventurer, Bruce Kirkby, as he encouraged an audience to alter their routine, get out of their comfort zone and find their own adventure. It is not about your abilities. It is about exploring beyond where you are comfortable. You should not expect to be comfortable while trying to do something hard, aka new, special, or magical (Yes, this is the whole ‘be comfortable being uncomfortable’ speech). In an exchange with Tessa Virtue (Olympic Champ Dance Figure Skater), who is on her way to the World Championships with Scott Moir, I realized that all of the training and preparation that they had done alters this image for them. 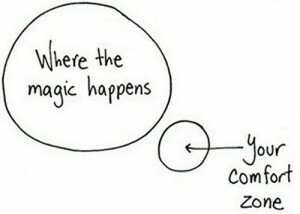 Their comfort zone had shifted; it’s larger and closer to “Where the magic happens”. I believe the two zones can overlap – but probably not completely. It is in our ambitious nature to always want to reach for little bit more, requiring a leap of faith – from our comfort zone towards the magic we seek. Your job every day is to shift and grow your comfort zone by getting out of it. This entry was posted in Mentor Messages and tagged comfort zone, London 2012, magic by Marnie. Bookmark the permalink. Your Comfort Zone vs Where the Magic Happens- I m trying so hard to venture out, and with every step I take I become more courageous, and usually happier.